This post contains affiliate links for products I’m obsessed with. 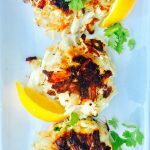 I’ve been wanting to make a FIX approved and gluten-free crab cake recipe for awhile now…but my husband and I are so darn picky about our crab cakes that I think I was afraid to fail. 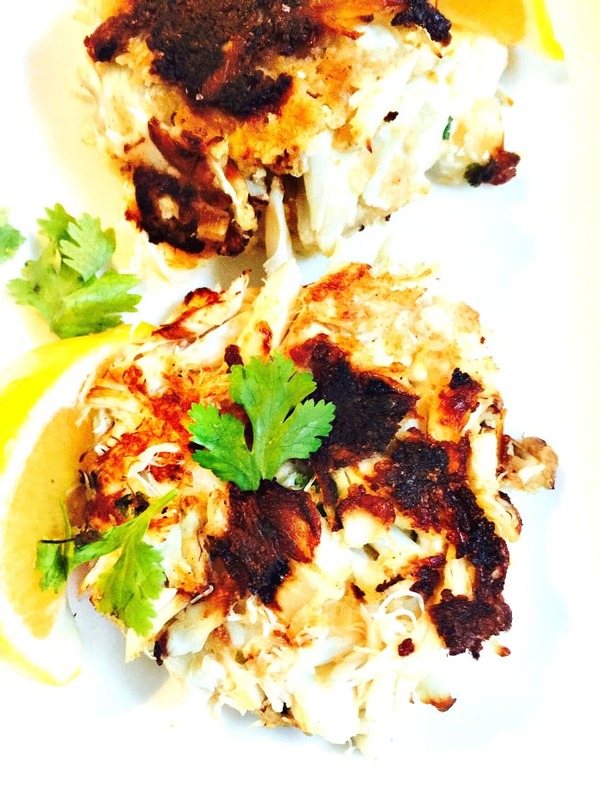 So with Valentine’s Day coming up, I decided to just go for it…because I am sure we will be staying in and crab cakes have always been one of our favorite dinners. I actually ordered crab cakes on our first date at this great little restaurant in Philly called Le Bus. 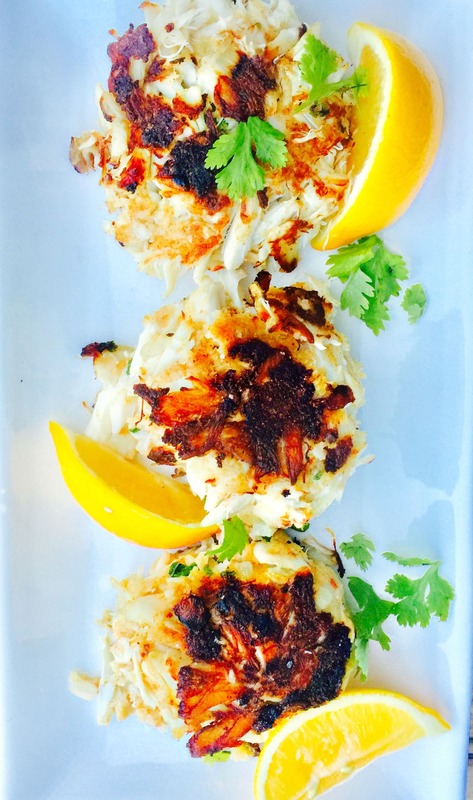 It’s been a Manayunk staple forever, and their crab cakes are to die for. I let my date have just the tiniest taste…he was hooked and that turned out to be one of the many times we had Crab Cakes at Le Bus. And for our wedding dinner, we chose surf and turf – Crab Cakes and Petite Filet Mignon. I’ve heard stories from other brides who never ate their wedding dinner in the chaos that is a wedding day. This bride? No – this bride was going to EAT. And that food was damn good. Anyway, back to these crab cakes. 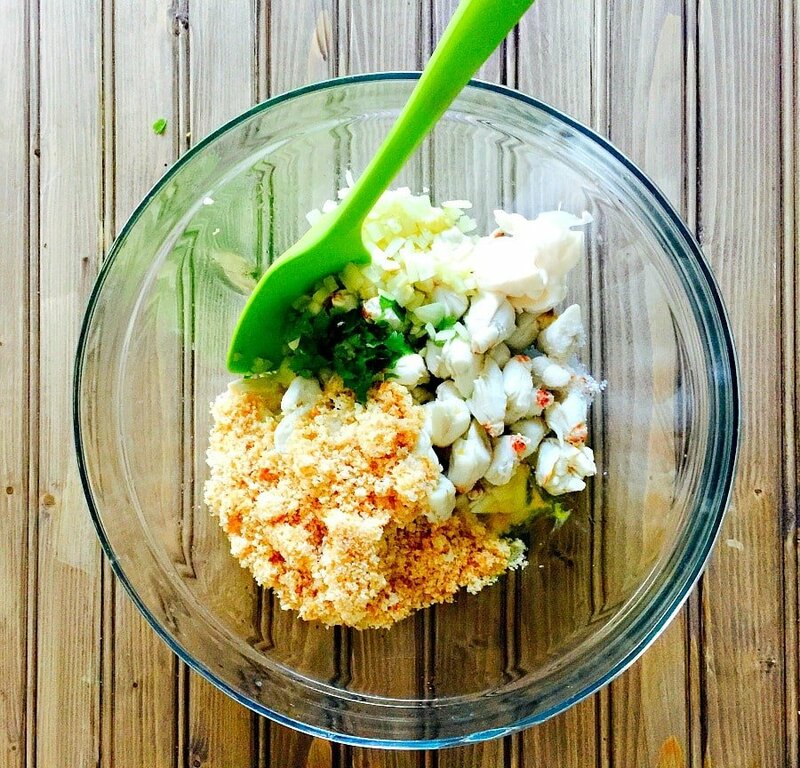 I started with Jumbo Lump crabmeat, which is an investment for sure, but totally worth it in a recipe like this. And although I am not a fan of mayo, I added just enough to help bind the crab cakes together. Mayo is now a teaspoon on the updated 21 Day Fix food list. I love this one from Primal Kitchen that uses Avocado Oil, but any mayo will do. I made some fresh gluten free breadcrumbs, and added some lemon juice, a little old bay seasoning, and freshly chopped cilantro. Chives would also be awesome, I just had cilantro to use up. Because these don’t use a lot of filler, they are super delicate and might fall apart a bit in the pan while cooking. 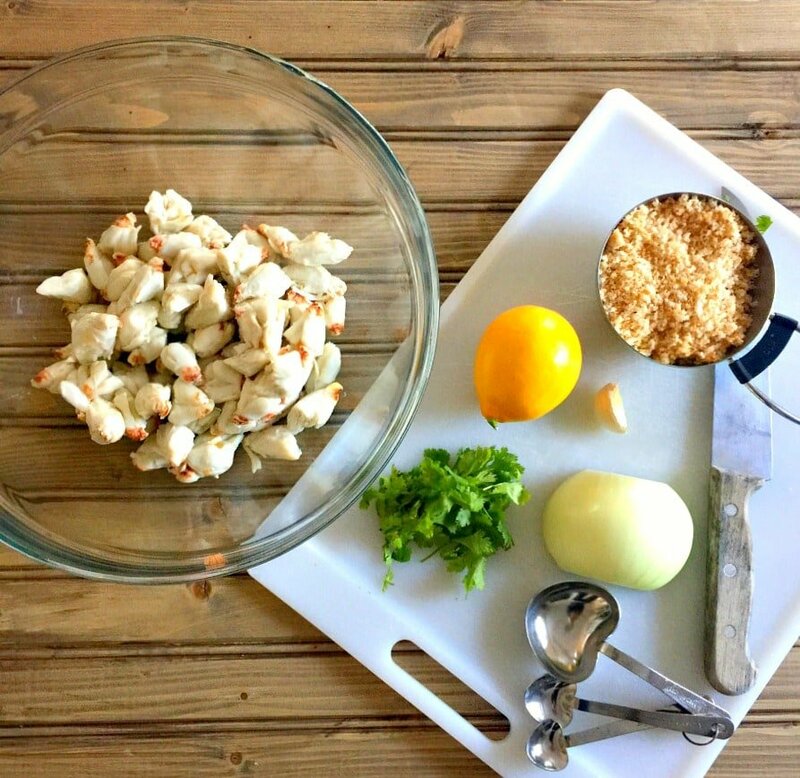 To help with this, assemble the crab cakes ahead of time and place them in the fridge for a hour or so. You might also want to make two at a time so you have plenty of room in your pan to gently flip them when ready. They came out perfect…so light, lemony, and flaky with just the right amount of crispiness, too. I love adding lots of extra lemon juice on mine – so don’t skimp! These are delicious over a bed of greens, or served with rice or cauliflower mash. They aren’t difficult to make, but they do feel special and would certainly be a good option if you, like me, can’t get a sitter and will be spending Valentine’s Day at home. If you give them a try, let me know what you think! Spray a non stick pan with olive oil spray and cook onion for 4-5 minutes over medium-low heat until the onion gets kind of caramelized, and in garlic and cook for an additional minute. 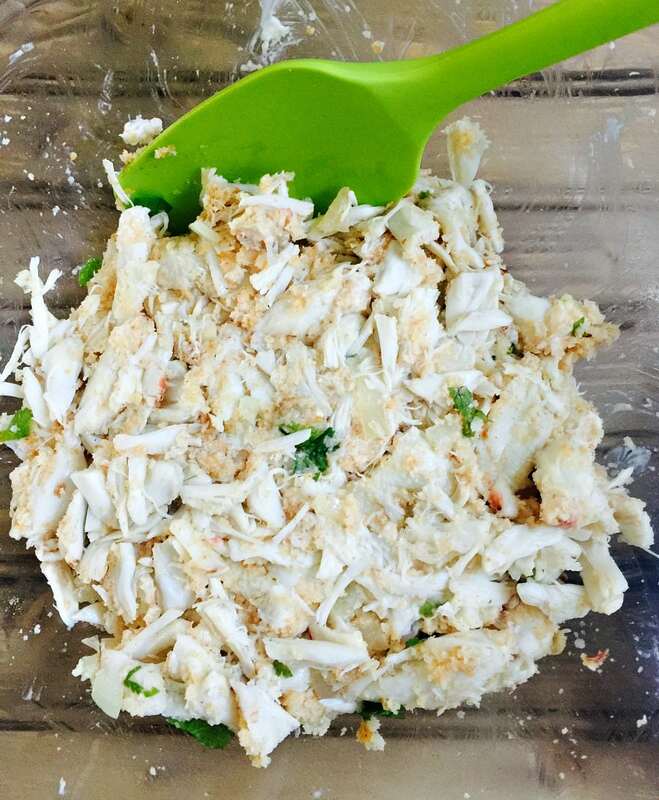 Dump that into a bowl and fold in the crabmeat, bread crumbs, mayonnaise, egg white, lemon juice, 1/2 tsp of salt, old bay, and cilantro, mixing just until well blended, being careful not to break up the lump crab too much. 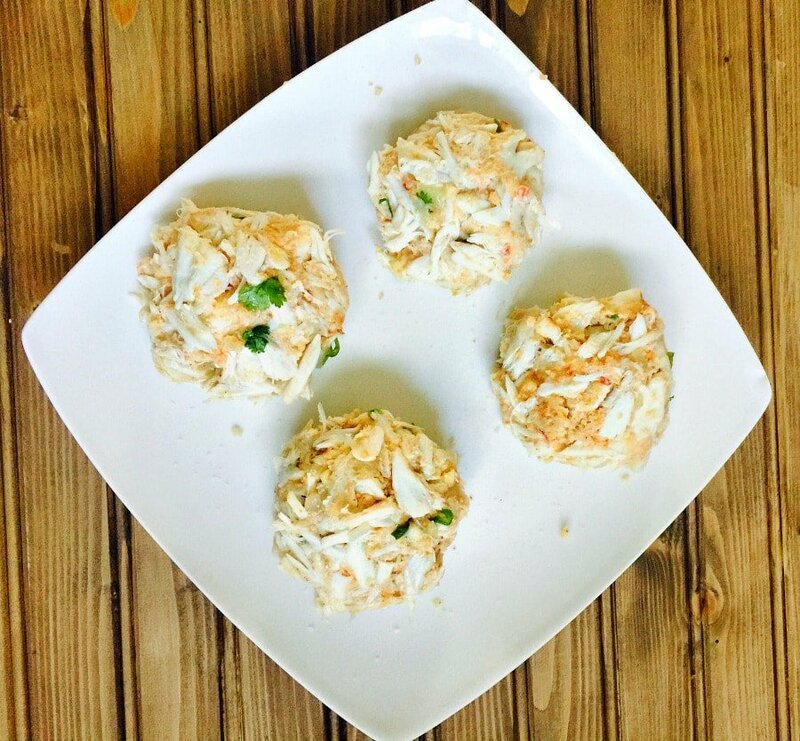 Shape the mixture into 4 fat crab cakes. Sprinkle with a little more salt and put them on a plate, cover, and stick them in the refrigerator to chill for at least an hour. To serve, heat butter and olive oil in a non stick pan over medium heat. 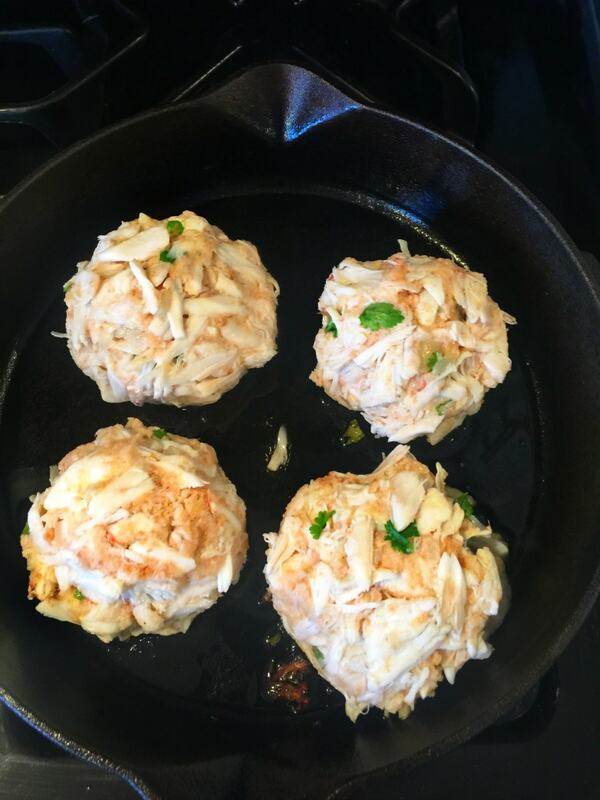 Add the crab cakes – two at a time if you want so you can flip easily – and cook for about 4 minutes each side until nice and crisp. Be careful flipping, as they can fall apart, but they will be delicious even if they do! 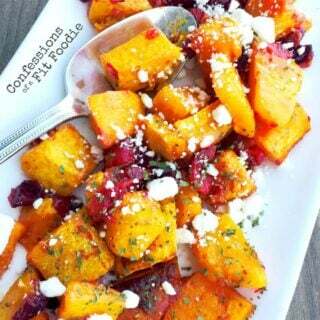 Serve with lots of fresh lemon juice. YUM! This comment made my day!!! Hope you enjoy!!! 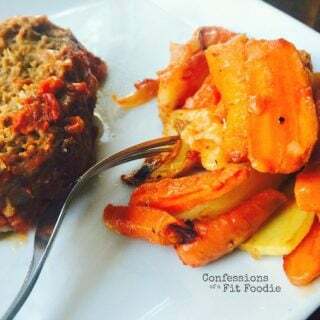 I love all your 21 day fix meals!! Awesome!! We love these, too!! I just pulse gluten free bread in a blender or food processor! I have now made the crab cakes twice and they are AMAZING. Absolutely amazing. And so easy!!!! YAY!! This makes me incredibly happy!! Could you make these in advance? Would they sit for 12 hours ok in fridge before cooked ? YES! This would be perfect for that!